I took the advantage of being at Village Pointe last night to get to Sephora to pick up my FREE birthday gift. 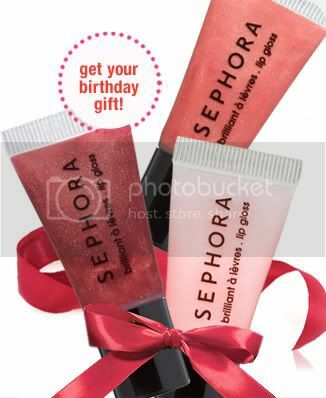 Did you know they give out FREE birthday gifts if you sign up for their Beauty Insider club (there’s no fee, it’s just a sign-up thing for specials, etc.). The little freebie was fantastic: a set of 3 tiny juicy lip gloss tubes – each their own tasty flavor. I love it! Backstory: I bought a drugstore eyeliner last week and promptly lost it. While I was at Sephora, I picked out a new eyeliner to replace my lost one. I was going to just get the Sephora brand since I like most of their stuff but they didn’t have any in stock so I bought a twist up eyeliner from TARTE. OH MY GOSH I’M SO GLAD I DID THAT!!! It is the tiniest pencil you’ve ever seen – so thin that it makes application extremely precise. And, for a girl who wears eyeliner but can’t wear mascara (it itches too much), this stuff is nothing short of a miracle. It’s like working with a professional pencil instead of a chunky toddler crayon! Anyway…highly recommend it!